3-piece stationery gift set with business card holder, pen holder and universal tray. Mod design leatherette stationery essentials set. Fun and great for any desktop with elegant black and contemporary inner color accents. Universal tray can be used for paper clips, change, notes or .. be creative! 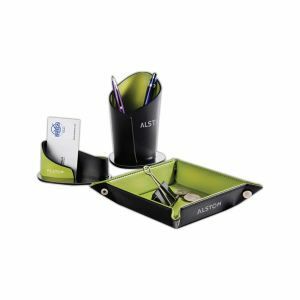 Generous sized pen holder holds all your pens and all other essentials, with metal base. Card holder holds plenty of business cards!